Visit Andalusia’s most famous cities — Cordoba, Seville, and Granada — on a 4-day immersion in the home of flamenco, tapas, and Andalusian culture. You’ll travel from Madrid to Cordoba to stroll through cobbled lanes in the city’s Jewish quarter, then spend two nights in Seville, the birthplace of flamenco. Admire Granada’s Moorish architecture at the World Heritage-listed Alhambra, and take a walk through the medieval walled city of Toledo. This comprehensive tour highlights the essential attractions of Andalusian Spain in four days, with 4-star hotel accommodation for all three nights. Please note: Entrance to the Alhambra is not guaranteed due to high demand. Your tour begins with a morning departure from Madrid to Cordoba, as your luxury coach takes you through the legendary countryside depicted in Don Quixote, the Man from La Mancha. 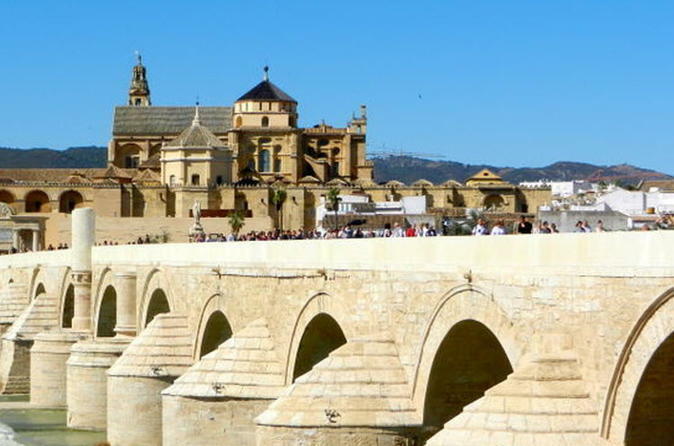 After lunch (own expense), take a tour of Cordoba to discover the city’s mix of Jewish and Arab culture. Admire Cordoba’s medieval architecture, with its whitewashed courtyards, alleys and squares. Leaving Cordoba, continue to Seville for dinner and your accommodation. After breakfast, enjoy a morning tour of the beautiful city of Seville, including the cathedral (from outside), Santa Cruz quarter and Maria Luisa Gardens. Discover the hidden secrets of this lively city built on the banks of the Guadalquivir River, with its rich Arab legacy and colorful local districts such as Triana and La Macarena. Spend the afternoon exploring Seville at your leisure, before returning to your hotel for dinner. In the evening, stroll along the riverside promenade, visit one of the city’s legendary bars or experience the drama and passion of flamenco at a Seville flamenco show (optional extra). After breakfast at your hotel, relax on board your luxury coach during the scenic drive along the historic Caliphate road to Granada. In this legendary city renowned for its amazing Moorish architecture, take a guided tour of the World Heritage-listed Alhambra and Generalife Gardens, one of Andalusia's special highlights. In the mosaic-tiled and landscaped gardens of the Alhambra, discover the culture and history of Spain’s Moorish rulers and admire their exotic architectural legacy. After dinner at your hotel, spend the evening at your leisure or watch a Gypsy Zambra flamenco show in Granada’s Gypsy quarter, Sacromonte (optional extra). Please note that entrance to the Alhambra depends on availability. Following breakfast at your hotel, enjoy a scenic coach ride to the World Heritage-listed imperial city of Toledo. Discover the city’s multicultural layering of Christian, Moorish and Jewish culture, and well-preserved medieval architecture. After lunch (own expense), take a guided walk into the past along Toledo’s cobblestone alleyways and enjoy a tour of the city’s monuments and landmarks. During the tour, hear about the work of baroque artist El Greco in Toledo, and see examples of Toledo’s signature Damasquinado metalwork, delicately etched with gold. Departing Toledo in the afternoon, relax on the return drive to Madrid, where your tour ends.